Olympic / Paralympic definitives updated, again - and again! Not for the first time distribution of the first stamps of the year has left collectors frustrated, and it seems that many collectors will not get their home-made FDCs for some weeks. As already reported, the automatic distribution of stamps in sheets has been achieved but it seems that there just wasn't an automatic distribution of booklets. 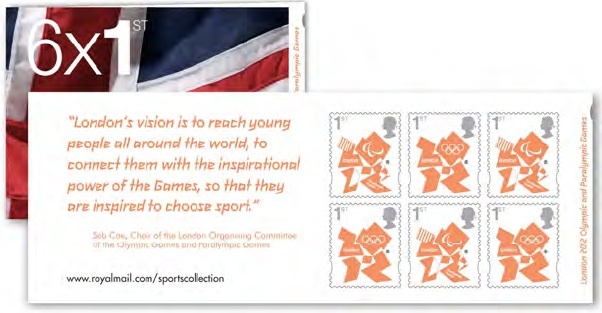 OK, so the stamps in booklets are the same as those in counter sheets (to all but the specialist), but many collectors like to collect FDCs of booklets which include the advertisement panel on the inside front cover. Readers will recall that there are two different 6 x 1st class booklets for this issue. The cover of booklet A shows the left of the Union flag, whilst the inside cover has a list of Key Dates for London 2012. Booklet B has the right part of the Union flag with a quote from Seb Coe. Two quite different booklets which are identifiable from the cover. Many smaller post offices and some Crown offices have none at all, while Bristol's main post office has 20 packs but all of type B and none of type A. Several people have written about their experiences in trying to find these stamps, first day covers, stamp cards etc. Two Midlands Crown Offices have told collectors that there are no Stamp Cards. Bristol is reported to have had only 10 first day covers. Anybody trying to find these on the Royal Mail website will find that the shop site is much improved, though the search facility is still underperforming. Search for 'olympic' and the two booklets appear. Browse through the 'stamp products' to 'stamp cards' and the Stamp Cards for this issue are there, so the Advice Line that told one of the Crown Offices that there were no stamp cards is wrong - or the website is wrong! (Update) If you collect cylinder blocks note that Royal Mail have been sending blocks of 4 (columns) x 3 (rows) to standing order customers, rather than 2 x 3. If you are ordering individual blocks, the two different 20g sheets have the same bar-code and the same short name (WW20G) printed in the margin. For the block with the last line starting with an Olympic stamp, you need grid rows 1 or 3. For the block with the last line starting with a Paralympic stamp, you need grid rows 2 or 4.
they will also be issuing a Generic Sheet. Retail packs of booklets have been found with 50 books alternating between the two covers. Type A, Type B, Type A and so on. I found the first pack in my local Sainsbury’s on the Friday after the first day of issue. The packs were produced by Walsall about 8 days after the initial stock in separate packs. Pack dates that I have seen are 15/11/11. Extra update from Kevin - apparently these mixed packs are also being distributed to some post offices - but in 6 packs not a single cylnder number was found. I hope this clarifies the scope of this new issue. Remember that if you do want to make FDCs of the booklets they can be handed over most PO counters for the special handstamp. Or they can be sent to the Special Handstamp Centres after the date of issue, if you include a note explaining why they are late there will not normally be a problem in getting them cancelled. Yep, here in south-west Scotland, too, only the sheet stamps available. Will try and find booklets in other p.o. 's today. Just wondering about the sheet stamps: what is the standard cylinder block size nowadays, with the self-adhesives? Is it still blocks of six? A good question Adrian, re cylinder blocks. Certainly most Machin collectors go for 6s, although you could save money as blocks of 4 will do nicely for self adhesives. 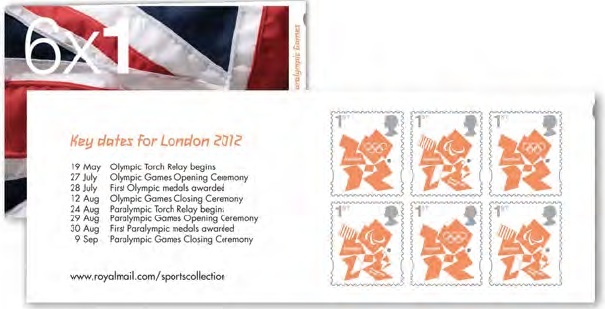 And for the Olympics a block of 4 gives you two pairs of stamps. Royal Mail's default for these seems to be vertical pairs - though everybody knows that horizontal pairs are easier to put in albums. And on that basis a block of 6 would contain 2 vertical pairs and 2 odd singles! Don't forget that there are two different cylinder blocks (however you collect them) for the 20g Worldwide. A friend who gets them from Tallents House was sent two the same. No PHQ cards at Cambridge (or two local PO) on Thursday. Even worse, FDC and PHQ cards had still not arrived at Trafalgar Square on Friday! Mixed packs of booklets found at Sainsbury's Stores - see detail in update above. Mixed packs also found at a post office.